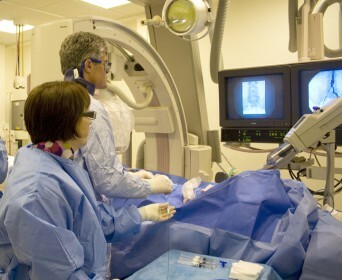 Interventional radiology is a speciality within radiology where imaging techniques are employed to perform therapeutic procedures within the body. Typically this involves a tiny incision, through which a thin steerable plastic tube is inserted and then guided to the correct location under x-ray guidance. Ultrasound and CT scanners may also be used to guide a procedure. Interventional radiology treatments are minimally invasive and are usually conducted under local anaesthesia. Patients usually require no more than one night in hospital and many can be treated as outpatients or day cases. The placement of a stent within the aorta to reline an aneurysm and reduce the risk of bleeding. Performed under local or spinal anaesthesia, the procedure is much safer than open surgical repair with a much shorter hospital stay. First described in 1995, it is estimated that uterine fibroid embolisation has now been used to treat more than 100,000 women worldwide. Fibroid symptoms include heavy menstrual bleeding, bladder dysfunction and pelvic pain. Via a tiny incision in the groin, the interventional radiologist steers a small plastic tube into the arteries supplying the fibroids. Tiny plastic particles are then injected into the fibroids, starving them of their blood supply and causing them to shrink away over the following weeks. Around 85-90% of women with heavy bleeding related to fibroids find their symptoms significantly improved by this treatment. Dr Dominic Fay performs this treatment in Bath, in association with Mr Nick Sharp, Consultant Gynaecologist. If you would like to find out more about fibroid embolisation or to enquire about being treated, please contact us here.